Dozens of Somerville Stands Together volunteers knocked on hundreds of doors last Saturday, talking to neighbors about the importance of building a Somerville that works for all of us. Somerville residents are becoming increasingly alarmed with wealthy out-of-town developers receiving tax breaks and sweetheart deals while families are priced out of their own neighborhoods and public service workers are denied fair contracts. 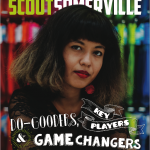 Somerville Stands Together (SST) launched in April 2018 in response to this growing wave of frustration. Since then, the coalition of labor, community and social justice groups has steadily gained momentum. More and more concerned Somerville residents and organizations have continued to join the campaign every week. Invest in new and existing affordable housing, to safeguard residents against displacement. Negotiate fair contracts for our city’s municipal workers. Update and enforce Somerville’s existing fair labor ordinances. Allow employees to form unions and hold free and fair elections at businesses that receive tax breaks from the City of Somerville. Hire local and union labor on construction projects to ensure high standards for safety and training and to provide family-sustaining career pathways for workers. As a result of the door knocking action, dozens of new members joined Somerville Stands Together to help build a Somerville that works for all of us. About Somerville Stands Together: Somerville Stands Together is a coalition of community and labor groups committed to maintaining the city’s diversity and its history as a place where hardworking families can build a life and a community. Somerville must continue to uphold progressive principles, where everyone is welcome regardless of race, creed or orientation; and where creativity and innovation are part of the fabric of our city. Somerville stands for immigrant rights, quality education, LGBTQIA rights, racial and economic justice, green justice, affordable housing and workers’ rights. The coalition includes AFSCME Local 274, Building and Construction Trades Council of the Metropolitan District, Firefighters Local 76, Good Jobs Somerville, Good Jobs, Strong Communities Coalition, Our Revolution – Somerville, Northeast Regional Council of Carpenters, Somerville Municipal Employees Association, SEIU Fireman & Oilers Local 3, SEIU Local 888, and Teamsters Local 122. The Somerville Stands Together logo is built with images licensed under Creative Commons via Wikimedia Commons  and with permission from Chris Devers . Site images: Tim Sackton and Chris Devers.